The T.E.A.M. 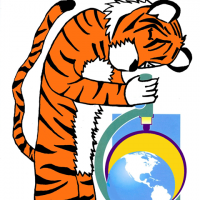 Science Café was incorporated into the national award winning EnvironMentors program out of LSU. After joining Teen Science Café Network, Program Coordinator, Brian Matherne, decided to do a trial of demonstrations and presentations using the TSCN guidelines during their spring meetings. The result was four great discussions involving teens and scientists. In the initial meeting, students received an introductory lesson on how to collect tree cores. 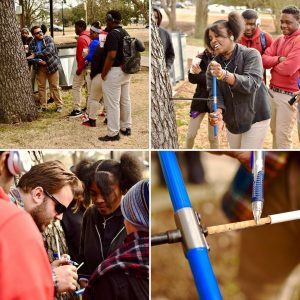 Mentor and LSU Geography graduate student Clay Tucker shared the tools of his trade and students got hands on experience extracting tree cores and learned about how Clay uses them for his dendrochronology research. 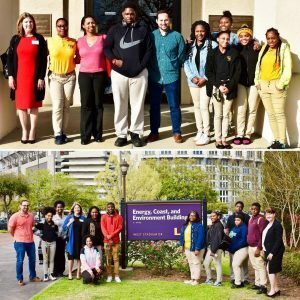 In March, students took a couple of short breaks from their research, to listen to a series of presentations from local attorneys about the merits of environmental law. In the first session, Tokesha Collins-Wright talked about her journey to becoming an attorney. She told a compelling story about how prior to law school she worked as an engineer before finding a passion for environmental law. The second session, led by Maureen Harbourt, went more in depth about the type of work that environmental attorneys do. She detailed how her knowledge of science allows her to effectively communicate with engineers and environmental consultants when working on compliance issues. In May, students learned about coastal restoration from Ryan Lambert, an outdoor guide. 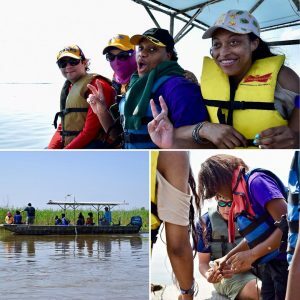 This trip included a day out in the marsh! 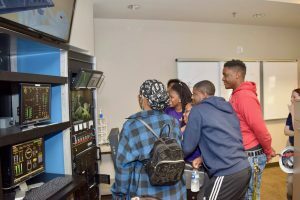 In the last meeting, Oceaneering hosted the EnvironMentors students at their ROV facility in Morgan City, LA. They learned how remotely operated vehicles (ROV’s) were developed and used for working at extreme ocean depths. The highlight of the tour was hands on experience with the simulators used to train ROV pilots.